The pre-Columbian history of the territory now comprising contemporary Mexico is known through the work of archaeologists and epigraphers, and through the accounts of the conquistadors, clergymen, and indigenous chroniclers of the immediate post-conquest period. While relatively few documents (or codices) of the Mixtec and Aztec cultures of the Post-Classic period survived the Spanish conquest, more progress has been made in the area of Mayan archaeology and epigraphy. Human presence in the Mexican region was once thought to date back 40,000 years based upon what were believed to be ancient human footprints discovered in the Valley of Mexico, but after further investigation using radioactive dating, it appears this is untrue. It is currently unclear whether 21,000-year-old campfire remains found in the Valley of Mexico are the earliest human remains in Mexico. Indigenous peoples of Mexico began to selectively breed maize plants around 8000 BC. Evidence shows a marked increase in pottery working by 2300 B.C. and the beginning of intensive corn farming between 1800 and 1500 B.C.. Between 1800 and 300 BC, complex cultures began to form. Many matured into advanced pre-Columbian Mesoamerican civilizations such as the: Olmec, Izapa, Teotihuacan, Maya, Zapotec, Mixtec, Huastec, Purépecha, Totonac, Toltec and Aztec, which flourished for nearly 4,000 years before the first contact with Europeans. These civilizations are credited with many inventions and advancements including pyramid-temples, mathematics[example needed], astronomy, medicine, and theology. Archaic inscriptions on rocks and rock walls all over northern Mexico (especially in the state of Nuevo León) demonstrate an early propensity for counting in Mexico. These very early and ancient count-markings were associated with astronomical events and underscore the influence that astronomical activities had upon Mexican natives, even before they possessed urbanization. In fact, many of the later Mexican-based civilizations would carefully build their cities and ceremonial centers according to specific astronomical events. Astronomy and the notion of human observation of celestial events would become central factors in the development of religious systems, writing systems, fine arts, and architecture. Prehistoric Mexican astronomers began a tradition of precise observing, recording, and commemorating astronomical events that later become a hallmark of Mexican civilized achievements. Cities would be founded and built on astronomical principles, leaders would be appointed on celestial events, wars would be fought according to solar-calendars, and a complex theology using astronomical metaphors would organize the daily lives of millions of people. At some different points in time, three Mexican cities (Teotihuacan, Tenochtitlan, and Cholula) were among the largest cities in the world. These cities and several others blossomed as centers of commerce, ideas, ceremonies, and theology. In turn, they radiated influence outward into neighboring cultures in central Mexico. At its height, Oasisamerica covered part of the present-day Mexican states of Chihuahua, Sonora and Baja California, as well as the U.S. states of Arizona, Utah, New Mexico, Colorado, Nevada, and parts of California. Cultural groups that flourished partially within the borders of modern-day Mexico include the Mogollon, Patayan, and Hohokam. These Oasisamerica civilizations maintained close ties with those of Mesoamerica, evidenced by turquoise trade, macaws, copper, cacao, and cultural exchange. 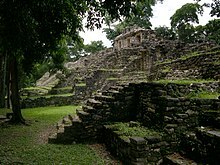 For example, in Paquimé, a site connected to the Mogollon culture, there have been found ceremonial structures related to Mesoamerican religion, similar to the juego de pelota. While many city-states, kingdoms, and empires competed with one another for power and prestige, Mexico can be said to have had five major civilizations: The Olmec, Teotihuacan, the Toltec, the Aztec and the Maya. These civilizations (with the exception of the politically fragmented Maya) extended their reach across Mexico, and beyond, like no others. They consolidated power and distributed influence in matters of trade, art, politics, technology, and theology. Other regional power players made economic and political alliances with these five civilizations over the span of 3,000 years. Many made war with them. But almost all found themselves within these five spheres of influence. Olmec colossal head 1, at Jalapa. The Olmec were an ancient Pre-Columbian people living in the tropical lowlands of south-central Mexico, roughly in what are the modern-day states of Veracruz and Tabasco on the Isthmus of Tehuantepec. Their immediate cultural influence, however, extends far beyond this region. The Olmec flourished during the Formative (or Preclassic) period, dating from 1400 BCE to about 400 BCE, and are believed to have been the progenitor civilization of later Mesoamerican civilizations. The decline of the Olmec resulted in a power vacuum in Mexico. Emerging from that vacuum was Teotihuacan, first settled in 300 B.C. By AD 150, it had grown to become the first true metropolis of what is now called North America. 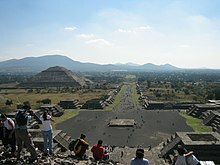 Teotihuacan established a new economic and political order never before seen in Mexico. Its influence stretched across Mexico into Central America, founding new dynasties in the Mayan cities of Tikal, Copan, and Kaminaljuyú. Teotihuacan's influence over the Maya civilization cannot be overstated; it transformed political power, artistic depictions, and the nature of economics. Within the city of Teotihuacan was a diverse and cosmopolitan population. Most of the regional ethnicities of Mexico were represented in the city, such as Zapotecs from the Oaxaca region. They lived in rural apartment communities where they worked their trades and contributed to the city's economic and cultural prowess. By AD 500, Teotihuacan had become one of the largest cities in the world. Teotihuacan's economic pull impacted areas in northern Mexico as well. It was a city whose monumental architecture reflected a new era in Mexican civilization, declining in political power about AD 650, but lasting in cultural influence for the better part of a millennium, to around AD 950. Contemporary with Teotihuacan's greatness was the greatness of the Mayan civilization. 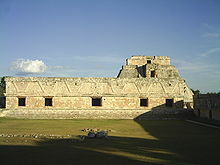 The period between 250 and 650 saw an intense flourishing of Maya civilized accomplishments. While the many Maya city-states never achieved political unity on the order of the central Mexican civilizations, they exerted a tremendous intellectual influence upon Mexico. The Maya built some of the most elaborate cities on the continent, and made innovations in mathematics, astronomy, and writing that became the pinnacle of Mexico's scientific achievements. Just as Teotihuacan had emerged from a power vacuum, so too did the Toltec civilization, which took the reins of cultural and political power in Mexico from about 700. The Toltec empire established contact as far south as Central America, and as far north as the Anasazi corn culture in the Southwestern United States. The Toltec established a prosperous turquoise trade route with the northern civilization of Pueblo Bonito, in modern-day New Mexico. Toltec traders would trade prized bird feathers with Pueblo Bonito, while circulating all the finest wares that Mexico had to offer with their divorced, immediate neighbors. The Mayan city of Chichen Itza was also in contact with the Toltec civilization were powerfully influenced by central Mexicans. The Toltec political system was so influential, that many future Mesoamerican dynasties would later claim to be of Toltec descent. In fact, it was this prized Toltec lineage that would set the stage for Mesoamerica's last great indigenous civilization. With the decline of the Toltec civilization came political fragmentation in the Valley of Mexico, and into this new game of political contenders for the Toltec throne stepped outsiders: the Aztec. Newcomers to the Valley of Mexico, they were seen as crude and unrefined in the eyes of the existing Mesoamerican civilizations, such as the fallen Toltec empire. Latecomers to Mexico's central plateau, the Aztecs thought of themselves as heirs to the prestigious civilizations that had preceded them, much as Charlemagne did with respect to the fallen Roman Empire. What the Aztecs lacked in political power, they made up for with ambition and military skill. In 1428, the Aztecs led a war of liberation against their rulers from the city of Azcapotzalco, which had subjugated most of the Valley of Mexico's peoples. The revolt was successful, and the Aztecs, through cunning political maneuvers and ferocious fighting skills, managed to pull off a true "rags-to-riches" story: they became the rulers of central Mexico as the leaders of the Triple Alliance. This Alliance was composed of the city-states of Tenochtitlan, Texcoco, and Tlacopan. At their peak, 350,000 Aztecs presided over a wealthy tribute-empire comprising around 10 million people, almost half of Mexico's then-estimated population of 24 million. This empire stretched from ocean to ocean, and extended into Central America. The westward expansion of the empire was stopped cold by a devastating military defeat at the hands of the Purépecha (who possessed state-of-the-art copper-metal weapons). The empire relied upon a system of taxation (of goods and services) which were collected through an elaborate bureaucracy of tax collectors, courts, civil servants, and local officials who were installed as loyalists to the Triple Alliance (led by Tenochtitlan). The empire was primarily economic in nature, and the Triple Alliance grew very rich: libraries were built, monumental architecture was constructed, and a highly prestigious artistic and priestly class was cultivated. All of this created a "First World" aura of invincibility around the island-city of Tenochtitlan. Unlike the later Spanish, the Aztecs did not seek to "convert" or destroy the cultures they conquered. Quite the opposite: the engines of warfare and empire in Central Mexico required that all participants understand and accept common cultural "rules" in order to make the flow of imperial wealth as smooth as possible. The rules of empire in Mexico were old rules, understood by all the power players and "contenders to the throne," as had been shown many times before (the kingdom of Tlaxcala would attempt its own power grab in 1519 by using the Spanish as mercenary-allies). By 1519, the Aztec capital, Mexico-Tenochtitlan, was among the largest cities in the world with a population of around 350,000 (although some estimates range as high as 500,000). Beijing at the same time had a population variously estimated to be 670,000 up to one million people. By comparison, the population of London in 1519 was 80,000 people. Tenochtitlan is the site of modern-day Mexico City. In the formation of the Triple Alliance empire, the Aztecs established several ally states. Among them were Cholula (the site of an early massacre by Spaniards), Texcoco (the site of a major library, subsequently burned by the Spanish), Tlacopan, and Matatlan. Also, many of the kingdoms conquered by the Aztecs provided soldiers for further imperial campaigns such as: Culhuacan, Xochimilco, Tepeacac, Amecameca, Coaixtlahuacan, Cuetlachtlan, Ahuilizipan. The Aztec war machine would become multi-ethnic, comprising soldiers from conquered areas, led by a large core of Aztec warriors and officers. This same strategy would later be employed by the Spaniards. The Aztecs left a durable stamp upon modern Mexican culture. Much of what is considered modern Mexican culture derives from the Aztec civilization: place-names, words, food, art, dress, symbols, and even the name "Mexican". (See also Origin and history of the name "Mexico-Tenochtitlan"). Today, the Aztec's capital city of Mexico-Tenochtitlan survives in modern times as Mexico City, the capital of the modern nation of Mexico. Mexico City is the largest metropolitan area in the Western Hemisphere (and second-largest in the world following Tokyo, Japan). In their haste to colonize, the Spanish initially retained much of the original layout of the city of Tenochtitlan, reflected today in the various city districts (barrios) and in the central precinct of the Zócalo (formerly the ceremonial center of Tenochtitlan). Many streets and boulevards lay along the same paths as the previous water canals of Tenochtitlan. Several pyramids and ruins have even remain unearthed within the urban sprawl of the city. Over the two centuries following the conquest, the lakes of the valley were drained, drastically changing the landscape. The former island city now was able to spread over a dry plain. Only small remnants of the old canal city remain, such as in the celebrated flower district of Xochimilco. Today, Mexico City incorporates over 25 million people, whereas in 1519, that number was 500 thousand. Mexico is a Megadiverse country. As such, many ingredients commonly consumed by today's people worldwide originate from Mexico. The names of the various foods are originally from Nahuatl. Examples of such ingredients are: Chocolate, Tomato, Maize and Corn, Vanilla, Avocado, Guava, Chayote, Epazote, Camote, Jícama, Tejocote, Nopal, Huitlacoche, Zapote, Mamey zapote, many varieties of modern Beans. These foods continue to make up the core of Mexican cuisine today. Because the Mexica spoke Nahuatl (the most common language at the time of Spanish arrival) their terms and names were widespread as descriptors of cities, regions, valleys, rivers, mountains, and many cultural objects. The Spanish used Nahuatl translators as they waged wars of conquest throughout Mexico and beyond. As a result, Nahuatl names were used as geographic identifiers as far away as Guatemala and the northern state of Coahuila on the southern Texas border. Numerous words from the Nahuatl language are today interspersed within Mexican Spanish. These words are used to describe geography, foods, colloquialisms, and first names for people (e.g., Xochitl, "flower," for females and Tenoch for males). Today, approximately 1.5 million people continue to speak the Nahuatl language. Recent years have seen a resurgence of interest in learning Nahuatl by Spanish-speaking and English-speaking Mexicans at-large. Some Mexican-American activists have portrayed Nahuatl language as a path to claiming an identity that is not European-based or Anglo-derivative (i.e. "Hispanic", "Latino", or "American"). The official story of Mexico is, the coat of arms of Mexico was inspired by an Aztec legend based on the founding of Tenochtitlan. The Aztecs, then a nomadic tribe, were wandering throughout Mexico in search of a sign that would indicate the precise spot on which they would build their capital. Their god Huitzilopochtli had commanded them to find an eagle devouring a snake, perched on top of a cactus that grew on a rock submerged in a lake. After two hundred years of wandering, they found the promised sign on a small island in the swampy lake of Texcoco. It was there they found their new capital, Tenochtitlan, also known as Mexico. Mexican art has inspired generations of Mexican-descent artists, both inside and outside of Mexico's modern borders. Images of pyramids, the "Aztec calendar", and armed indigenous warriors have been popular themes. Also popular have been zig-zag motifs (found on indigenous buildings and pottery) and the theological notion of The Four Directions (found among indigenous cultures across the Western Hemsiphere). In recent years, there has been a resurgence of interest in the ceremonies and art of the Day of the Dead. The art, architecture, and symbols of the Mexica civilization exert such a unique identity that they are commonly used in advertisements for tourism to Mexico. For much of its history, the majority of Mexico's population lived an urban lifestyle: cities, towns, and villages. Only a fraction of the population was tribal and wandering. Most people were permanently settled, agriculturally based, and identified with an urban identity, as opposed to a tribal identity. Mexico has long been an urbanized land, which was graphically reflected in the writings of the Spaniards who encountered them. ^ Paul R. Renne; et al. (2005). "Geochronology: Age of Mexican ash with alleged 'footprints'". Nature. 438 (7068): E7–E8. doi:10.1038/nature04425. PMID 16319838. ^ "Olmec Civilization". Ancient History Encyclopedia. Retrieved 7 November 2018.